I have never been a father. I have never been a black man struggling under the curse of the drug war. I have never gone anywhere near a jail, never tasted the desperation and pain of the ghetto, never seen a man die. I wasn’t even alive during the Reagan era. My world doesn’t include those things. The world, however—the one past my borders—does. And Reginald Dwayne Betts’ ‘Bastards of the Reagan Era’ is a lens staring into the very heart of the world I don’t know, throwing a light so sharp that the edges of its shadows cut for blood. Yet it’s not only visual light: Betts’ writing is musical, enjambment and line breaks skittering together, rhythm running under lines and diving out of hearing to let particular words soar high over it. In many ways, this is bard work: history, story, song, railing against, all in one. I almost feel as though I’m eavesdropping on a song, a ragged and ragtime elegy not meant for me. “A public defender once explained it perfect. The link between slavery, human cargo in the belly of a ship, and the continuing theft-repossession of black bodies laces every word. For me, it’s heavy: the weight of a sin in my blood that hasn’t yet, perhaps cannot, be expiated. Maybe for some it will feel like an accusation of a crime they think they have no part in. Betts, however, isn’t attacking anyone. Like I said, this book isn’t about white people. 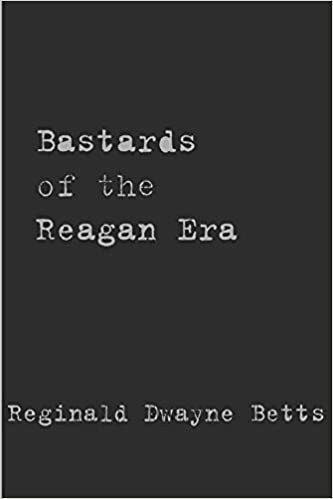 As so many of his titles allude to, ‘Bastards of the Reagan Era’ is a volume of elegies, caught “in a fight with God and the Devil”. I would recommend this book to anyone who lives in America’s present moment. I would say that every white American should read this book and do the work it asks of us, to consider the world it reveals and break the cultural stereotypes that keep us from looking through that lens. I would say: “this book does what poetry must”.